The Knicks are hoping for a good spot in the draft lottery, but historically they haven’t had high picks as often as you’d expect. Update (May 16, 9:20 p.m.): After the NBA draft lottery Tuesday night, the Knicks are now slated to pick eighth; they would have gotten the seventh pick if draft order were decided by record alone. When the NBA holds its annual draft lottery tonight, the New York Knicks will have a 5.3 percent chance of winning the top pick in next month’s draft and an 18.3 percent chance of landing in the top three. Their fans will be keeping their fingers crossed for a little good news — for once. Since trading franchise icon Patrick Ewing before the 2000-01 season, the Knicks have won one playoff series and amassed the league’s third-worst regular-season record.1 Fans of dreadful teams can usually cling to the likelihood of high draft picks and the hope for the future they bring. But the Knicks have managed to bungle that too. I compared teams’ regular-season performance2 to their average position in the drafts following each of the 16 seasons from 2000-01 through 2015-16.3 In general, good teams should have bad picks and bad teams should have good picks. That’s how the system’s designed, after all. If your team stinks, at least you have a shot at the best players in the draft. As one of the worst teams in the NBA since 2000-01,4 the Knicks should have had one of the best average draft positions. Instead, New York’s front office fumbled its way to the 6th-worst average in the league, combining on-court ineptitude with draft-night hopelessness. Let that sink in for a moment. Over the past 16 years, the only teams with worse average draft position than the Knicks were the Spurs, Mavericks, Heat, Lakers and Pacers. These are all successful teams that generally picked late because they were good at basketball. 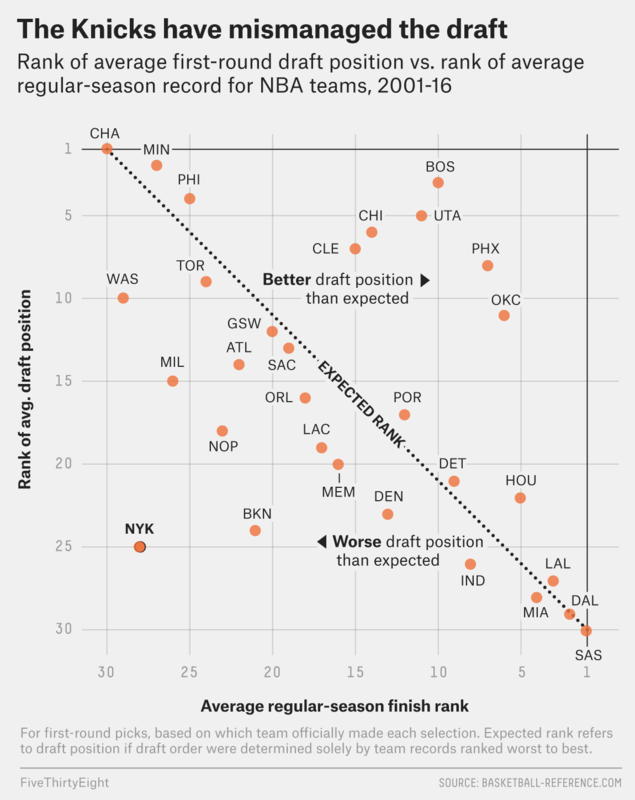 Not surprisingly, the Knicks own the largest average discrepancy between where they should have picked in the draft and where they actually picked. The Nenê trade isn’t the exception, either. For the most part, all this wheeling and dealing has left New York no better off than they were when they started. *All trades involved multiple players. **The Knicks gave Denver the right to swap 2016 first-round picks in the Anthony trade. They traded away the pick entirely in the Bargnani trade. When the Knicks actually make picks, they tend to draft pretty well. They’ve made 12 first-round selections since 2001, and many of them, including Nenê and Kristaps Porzingis, have turned out to be pretty good or even great picks. But the Knicks traded a lot of those guys away and got relatively little in return. Holding onto picks before the draft is one step out of this downward spiral for the Knicks. Holding onto them after will be another. In the meantime, a little bit of luck with the pingpong balls at tonight’s lottery won’t hurt. Through the 2016-17 season. Coming into this season, the Knicks had the 4th-worst regular-season record since 2000-01. In terms of average regular-season rank at season’s end, which is the primary basis for determining draft order. For the first four seasons of my analysis, the NBA had 29 teams. I adjusted those ranks to 30-team equivalents. I adjusted for ties too; if two teams were tied for the 5th-best record, for example, I assigned both a rank of 5.5. These adjustments help normalize rankings. Based on which team officially made each selection on draft night. Team averages include drafts in which they had no first-round picks, either because of trades or violations. I captured franchise history according to official records, so the Hornets’ 2000-01 and 2001-02 seasons belong to Charlotte, not New Orleans. I assigned the 2002 draft to New Orleans. As a result, Charlotte has 14 seasons and 14 drafts from the 2000-01 season through the 2016 draft, while New Orleans has 14 seasons and 15 drafts. All other teams have 16 seasons and 16 drafts. This knocked New York out of the top three, which, under the terms of a previous trade agreement, enabled Seattle to swap first-rounders with the Knicks and draft Scottie Pippen. This includes drafts in which the Knicks still picked in the first round but the terms of a deal caused them to pick later than they would have otherwise. Houston had the option to swap 2011 first-round picks with the Knicks via the Tracy McGrady deal but did not do so, so that is not included. Nenê, meanwhile, has produced 69.3 regular-season win shares over 15 seasons.